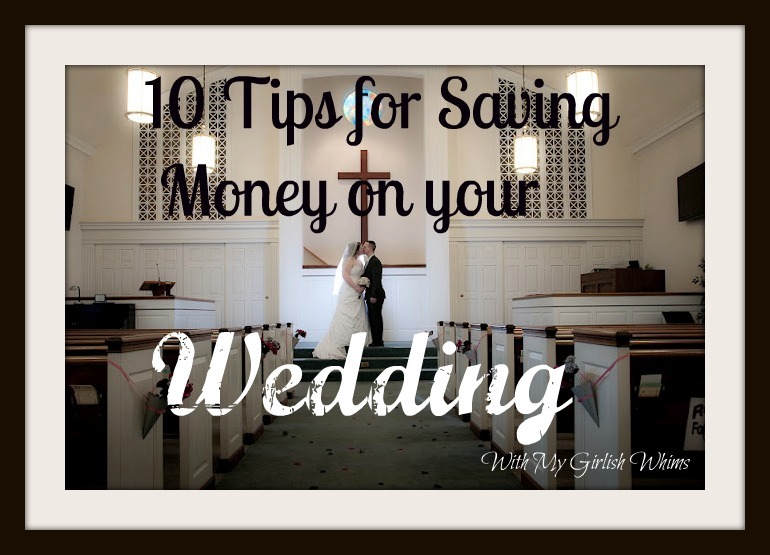 So it's coming up on three months since my big wedding day....and I thought I would do one last post talking about some of the areas I saved the most money in! Cheap weddings are possible: I believe it's all about picking and choosing where you want to spend the money most. 1. Have an off season wedding. This is the BIGGEST tip I can give you. I know, I know. We all want out wedding on that Saturday in the middle of June on a nice, summer, sunny day. Well, because everyone wants a wedding then all the vendors will be more expensive then as well! I got a great deal on my reception vendor and photographer because my wedding was at the end of February and these places were not normally booked then. 2. DIY what you can and what you feel comfortable with. You can see all the Wedding DIY I did for my big day. Doing DIY for decor, flowers, favors, etc. helped me save SO much cash. 3. Cut back on flowers. That bill adds up fast. Analyze where you really need flowers, and only use them there. We nixed boutonnieres, corsages, and using real flowers for decor. The flowers we needed for the bouquets we got in bulk from Costco. 4. Use the people you know. My uncle DJed my wedding for free for me, my old harp teacher played during my ceremony for free, and my old roommate from college put my bouquets together! Now, you may not all have DJ uncles or have taken the harp, but you may have family or friends who could fill in for free or low cost for some of the important wedding necessities. 6. Keep a smaller guest list. Most reception sites make you pay by the person, so the more people you have, the more it will cost! I had just under 100 people at my wedding. Yes, we didn't have any children and not all boyfriend/girlfriends were invited, but we kept a manageable and fair guest list that helped keep our costs low. 7. Use what you have....or what your friends have. My wedding shoes were shoes I had bought for a college dance. My veil came from my sister's veil and my mother-in-law's veil. I found out AFTER I bought a puffy slip for under my dress from David's Bridal, that a friends had the same thing in the same size I could have just borrowed. I mean, puffy wedding slips don't go bad haha. Certain things like shoes/jewelry/etc. can easily be borrowed. 8. Limit the hours of your vendors. We only paid to have our photographer stay for part of the reception and had a friend cover the things like cutting the cake that took place towards the end of the reception. That way we did have a professional photographer for most of the important stuff, but were not in debt from it! 9. Be smart with the booze. We only paid for beer & wine up to $500. (At the last minute, my new MIL decided to keep the tab going later into the night, but we ourselves did not pay for more than $500 worth!) Consider only doing an open bar for the cocktail hour or limit what is free from the bar. 10. Prioritize. It's YOUR big day. Spend the most money on the things that really matter most to you. I knew I wanted a gorgeous dress, but didn't really need extravagant centerpieces. I wanted to be able to serve all my guests a meal but didn't need fancy invitations with tons of matching info cards and perfect calligraphy. Figure out what you really want done nicely from the wedding, and allocate funds accordingly!! The nitty gritty: hubby and I spent around $6,000 for our wedding of 100 guests held in February. Affordable weddings can happen! Rebecca, it was so kind of you to stop and take the time to leave me a note at Quirky Vistas about my shelf. This is a great post. There are so many ways to have a truly memorable wedding without breaking the bank and you have highlighted so many of them. I love when people make their weddings personal and find creative ways to celebrate the day. We did all that! We had a really inexpensive wedding. My wedding was around $2,000 for over 200 people...and it was in June! Affordable weddings really are possible! Love your ideas. I'm getting married next June and we have to keep a tight budget. I'm loving all your DIY's too!